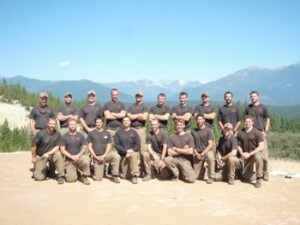 CEDAR CITY – On June 30, 19 firefighters from the Granite Mountain Hotshots of the Prescott Fire Department perished in the Yarnell Hill Fire in Arizona. Among them was Southern Utah native Joe Thurston. Born and raised in Cedar City, 32-year-old Thurston left behind his wife, Marsena and two young sons, Ethan and Colin, after his sudden and shocking death in the blaze. A benefit event honoring the fallen hero and supporting his family will be held Saturday at Main Street Park in Cedar City. The event begins at 3 p.m. and will include a raffle, food, children’s activities, live entertainment and many more fun activities for the whole family. Any donations will be greatly appreciated, along with volunteer requests.